Structure Deck: Zombie Horde unleashed a new wave of undead terror, but that it was just the beginning! The new Hidden Summoners set brings an entirely different approach to the Zombie theme with the Mayakashi – a bizarre tribe of monsters inspired by the mythical Yokai spirits of Japan. The Mayakashi take Synchro Summoning in a powerful new direction. Starting with just a single card, they gather Synchro Materials to make one small Synchro Summon, then use it as the basis for a bigger one. Then they do it again. And again and again, until you’re staring down one of the biggest Synchro Monsters ever printed. How do the Mayakashi do it? Let’s take a look. It all starts with Dakki, the Graceful Mayakashi. 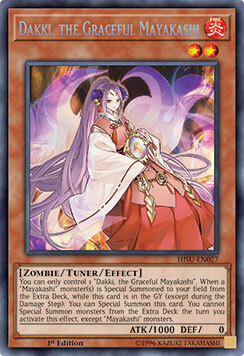 She’s a Level 2 Zombie-Type Tuner, and if she’s in your Graveyard you can revive her whenever a “Mayakashi” monster’s Special Summoned from your Extra Deck. That means you can bring Dakki back the moment you use her as a Synchro Material or Link Material. She pairs with Hajun, the Winged Mayakashi, a Level 1 non-Tuner that Special Summons any other Mayakashi from your Deck when it’s Normal or Special Summoned. The basic play is to Summon Hajun, use its effect to Special Summon Dakki so you can Tune them together for a Level 3 Synchro Summon. That play lets you revive Dakki, so you can Tune her to your Level 3 Synchro for a Level 5. Then you’ll bring her back again to upgrade to a Level 7 Synchro, and a Level 9, and finally a massive Level 11. The Mayakashi tribe has five Synchro Monsters at their command, and wouldn’t you know it, they happen to be Level 3, Level 5, Level 7, Level 9, and Level 11. So any turn where you can Summon Hajun and search out Dakki, you’ll end with at least a Level 11 Synchro Monster. More on those in a bit. 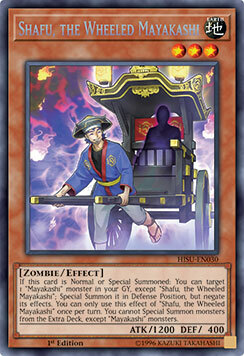 For now it’s worth talking about Hajun’s Graveyard counterpart, Shafu, the Wheeled Mayakashi. While Hajun Special Summons a “Mayakashi” monster from your Deck, Shafu brings a Mayakashi back from your Graveyard, Special Summoning it in defense mode and negating its abilities. You can use Shafu to revive big Mayakashi Synchros, but you can also use it to Special Summon Dakki and make even bigger combos. For instance, if you have Hajun, the Winged Mayakashi and nothing else, your play will be to Summon Hajun, Special Summon Dakki, and then use her to climb through five Synchro Summons to a Level 11 Synchro. But if you have some way to get Dakki to the Graveyard instead, you can do that, use Hajun to Special Summon Shafu from your Deck, and then use Shafu to revive Dakki. With three monsters on the field instead of tow, you can combine Shafu and Dakki to Link Summon the Mayakashi’s signature Link Monster, Yuki-Onna, the Ice Mayakashi. Once you do that the standard Dakki rules apply: you can put her right back on the field, then Tune her with Hajun. From there you’ll go off into your string of Synchro Summons, but you’ll also have a Link Monster that protects itself and that offers you two Link Markers for twice the Synchro power. Setting all that up is easy. 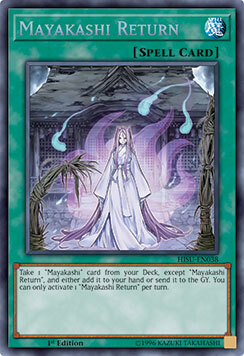 Mayakashi Return is a Spell Card that lets you search any other “Mayakashi” card from your Deck, adding it to your hand or sending it to the Graveyard as you choose. It’s like Reinforcement of the Army and Foolish Burial in one. 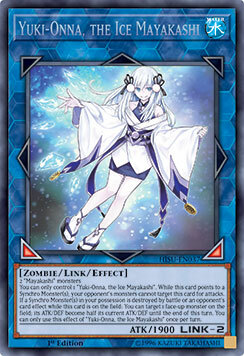 Combined with Shiranui Solitaire and Uni-Zombie, the Mayakashi Deck becomes really consistent. With that in mind have a look at what they’re working with. Each of the five “Mayakashi” Synchros get stronger, starting with Oboro-Garuma, the Wheeled Mayakashi at 800 ATK, and finishing with mighty Gashadokuro, the Skeletal Mayakashi, clocking in at Level 11 with 3300 ATK and 2600 DEF. Each Synchro Monster packs two effects too. 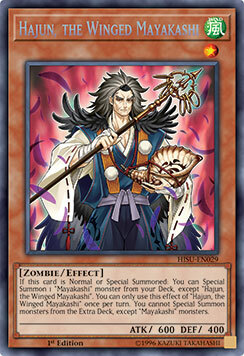 One is universal: when one of your Extra Deck “Mayakashi” monsters is destroyed by battle or an opposing card effect, you can banish a Zombie from your Graveyard to revive the next Synchro down the chain. You can revive the Level 11 Gashadokuro when one of your Link Monsters is destroyed. When that hits the dirt you can bring back Yoko, the Graceful Mayakashi at Level 9. It leads into Tengu, the Wigned Mayakashi at Level 7, then Tsuchigumo the Poisonous Mayakashi at Level 5, and finally back to the Level 3 Oboru-Guruma. Whenever you revive a “Mayakashi” Synchro you’ll trigger a unique ability, too. From protecting themselves from card effects or destroying a monster without targeting, to popping a backrow or forcing both players to send cards from their Deck to the Graveyard, the downward climb packs a lot of different ways to muck up your opponent’s plans. Combined with classic Zombie support like Book of Life, Mezuki, and Zombie World, the Mayakashi tribe has more than a decade of undead tricks to call upon! Grab your favorite cards from the Structure Deck: Zombie Horde and get ready for this Friday when the Mayakashi debut in Hidden Summoners.